Make a Monochrome Spike Choker necklace using the new beads from Swarovski! Cut two lengths of wire measuring approx. 2 metres long each. Thread an end through the top loop of the box clasp, leaving a 2 inch tail. Thread a crimp bead onto both of the strands and push it up to the loop of the clasp. Squash the crimp bead flat. String 10 seed beads onto the main wire and the tail thread to hide it. Now repeat this again for the bottom hole of the same box clasp. Alternate between a hexagon spike bead and 4 seed beads until you have 9 small hexagons, threading both strands of wire through the bead holes. Then add 3 seed beads onto both strands together. Add a big hexagon threading a wire through each of the holes. Add 3 seed beads, a big hexagon, 3 seed beads and another big hexagon. Add 3 seed beads onto both of the strands togther and thread through one side of another hexagon. Add 6 seed beads and go through one side of another hexagon. Add another 6 seed beads and go through another hexagon. Thread around this last hexagon and add 2 seed beads. Thread through the second hole on this hexagon. Continue up the other side of the hexagons added before, adding 6 seed beads between them onto both strands of wire. This will be the centre of your necklace (see image). Continue to split your wires and then bring them together again to replicate the first side of the necklace. Finish your necklace in the same way as you started, adding a crimp bead, threading through the box clasp and threading back down through the crimp bead and the next few beads. Crush the crimp bead to secure the wire in place. 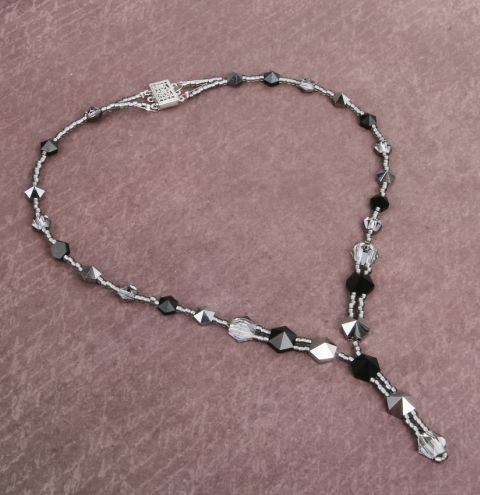 Trim off any excess wire when you are happy your design is secure and there are no gaps in the beads.